The state Board of Fisheries holds meetings all over Alaska, where decisions effect local residents. But it hasn't met in Kenai since 1999. Kenai setnetter Ken Coleman was there the last time the state Board of Fisheries met on the Peninsula in 1999. 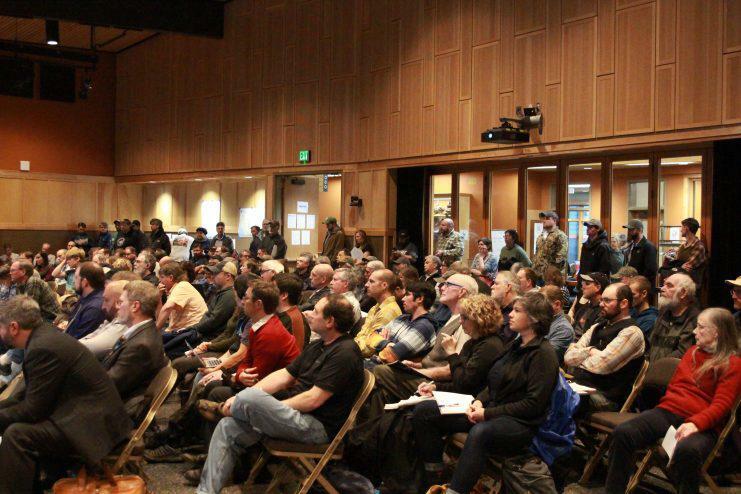 The tumult Coleman talked about is generally regarded as the reason why Upper Cook Inlet finfish meetings continue to be held in Anchorage, despite repeated requests to move them. And last year, the board did decide to start moving them on a rotating basis between Anchorage, the Peninsula and the Mat-Su Valley. “It sure seemed to me like the policy that we passed last year really solved those things, and that passed 4-2," said board member Robert Ruffner. The 4-3 vote Friday approved moving the 2020 meeting back to Anchorage, leaving some questions about what the policy to rotate meetings means now. The vote to change the meeting location was a surprise. It wasn’t on any agenda, but some who pay extra close attention to the goings on at the board of fish had a little heads up, like Kenai mayor Brian Gabriel, who’s also a commercial fisherman. He and the city managers from both Kenai and Soldotna hustled up to Anchorage Friday to find out more. He says they were told before the board broke for lunch that there wouldn’t be a vote that day and instead, a meeting would be held later by telephone. A public notice period would have given time to submit more comments to the board regarding where the 2020 meeting should be held. But a vote was called for Friday afternoon. Transparency around this vote is now the major issue. Senators Peter Micciche and Gary Stevens, along with Representatives Gary Knopp, Ben Carpenter and Sarah Vance all signed on to a letter to board chair Reed Morisky that says they feel the public process was circumvented at the meeting last Friday. The letter also highlights Governor Mike Dunleavy’s call for more transparency, something Robert Ruffner fully supports in board procedures. Public trust is just one consideration. Another is economic. It would no doubt be a boost for local businesses to have a few hundred people spend two weeks here in the middle of winter to attend the meetings. Mayor Gabriel says he’s been lobbying since the 2014 cycle to get the meetings back to Kenai. Statewide finfish and other supplemental issues will be taken up in March, when the board had originally planned to reevaluate meeting locations for 2020. After being turned aside in May, the Kenai River Sportsfishing Association has won another audience before the Alaska Board of Fisheries regarding problems the lobbying group has with hatchery pink salmon production in Prince William Sound. In May, the Board punted the issue to Alaska Department of Fish and Game Commissioner Sam Cotton. Last week Cotton sent a letter to KRSA Executive Director Ricky Gease saying he did not find that an emergency existed and denied the petition.